A new learning algorithm is illustrated on a molecule known as malonaldehyde that undergoes an internal chemical reaction. The distribution of red points corresponds molecular configurations used to train the algorithm. The blue points represent configurations generated independently by the learning algorithm. The turquoise points confirm the predictions in an independent numerical experiment. Credit: Leslie Vogt. "By identifying patterns in molecular behavior, the learning algorithm or 'machine' we created builds a knowledge base about atomic interactions within a molecule and then draws on that information to predict new phenomena," explains New York University's Mark Tuckerman, a professor of chemistry and mathematics and one of the paper's primary authors. The paper's other primary authors were Klaus-Robert Müller of Berlin's Technische Universität (TUB) and the University of California Irvine's Kieron Burke. "Now we have reached the ability to not only use AI to learn from data, but we can probe the AI model to further our scientific understanding and gain new insights," remarks Klaus-Robert Müller, professor for machine learning at Technical University of Berlin. 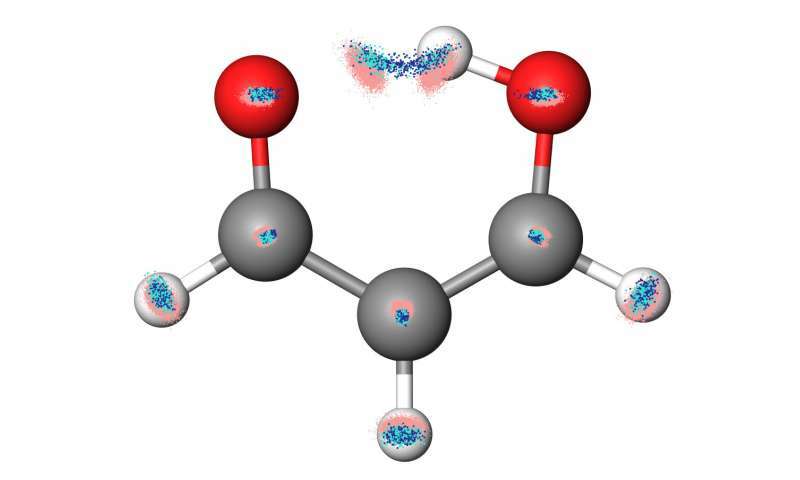 A video demonstrating, for the first time, a chemical process that was modelled by machine learning—a proton transferring within the malonaldehyde molecule—can be viewed here: wp.nyu.edu/tuckerman_group/res … ch/machine-learning/ .